Finding the perfect travel, gym, or even everyday bag can be an overwhelming ordeal thanks to the incredibly huge variety of products available. For this, you can always turn to the best duffle bags. Duffle bags offer greater versatility than backpacks because of their increased size, which allows for greater storage, an increased number of compartments, and varying carry methods. While you do lose the comfort often found with backpacks, you'll definitely find a greater variety of uses for a quality duffle bag. This article takes a comprehensive look at five of the most popular duffle bags currently available on the market. We'll take a look at their construction, functionality, and affordability. By the end of this article, you should have a clearer understanding of the features available and whether or not any of these bags are the right fit for you. 1. What is a duffle bag? 2. How do you pack a duffle bag efficiently? 3. What size of duffle bag is acceptable as a carry-on? 4. Are duffle bags allowed as a carry-on? 5. What size of duffle bag do I need? This bag looks great and is available in a variety of colors and styles. It offers fantastic functionality while being made out of strong and durable materials, ensuring a long life. This is a great medium- to high-end bag that is also available in a variety of sizes. This duffle bag offers plenty of space at varying levels. The small size measures in at 20.5 by 11.75 by 11 inches, the medium ones are 24 by 13 by 12 inches, and the large bags are 29 by 15 by 12 inches. This makes it a great option for a large number of buyers depending upon their individual requirements. The bag is constructed in a way that it retains its shape, making it far easier to pack items without ruining its appearance. This also benefits the two, zippered, end pockets as there's no more rummaging around for smaller items that are otherwise easily lost. One of these pockets is designed as a FreshPak ventilated shoe tunnel, which allows for both wet and dry storage. The users also have the choice of using the carry handle located above the main compartment for quick and easy handling of the bag, or the padded should strap for a more comfortable method of transportation. We love the fact that this product is built to last. This duffle bag boasts reinforced ripstop polyester fabric, which prevents wear and tear. More than that, it also has reinforced stitching all throughout. Adidas have also backed this product with a lifetime warranty, so if you do have any problems, you can simply contact them, and they'll arrange a replacement for you. This level of customer service is always appreciated and helps to reassure customers that spending a bit more money on this bag is 100% worth it. Despite a wide variety of colors and styles being available, these vary alongside the bag sizes. This means that the size of duffle bag you select determines the number of styles available to you. While this shouldn't be a determining factor in a buyers choice, it's certainly an influencing factor. 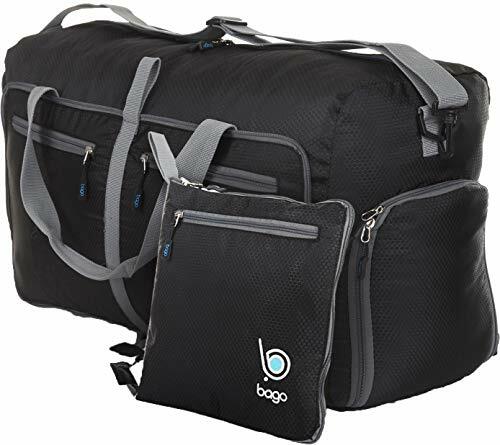 The Bago Travel Duffle Bag is designed for all things related to traveling, which is why the company used a lightweight and durable material. This material is also water-resistant. This bag is great for those regularly on the move and want something that is easier to handle yet still offers a large capacity. Offering a fantastic amount of storage at 85 liters capacity, this bag measures in at 11 by 15 by 27 inches when expanded but can be folded down to an extremely convenient and portable size of 11.8 by 12.6 inches. This allows the bag to be easily stored away when not in use or when it needs to be transported while it's empty. Its durable construction can be derived from its honeycombed, ripstop fabric design, pull string zippers, and water-resistant coating. Designed as a travel duffle bag, everything about this bag focuses on providing functionality while remaining as lightweight as possible. The end result is a duffle bag offering a large capacity but only weighs 1.5 pounds. This is 75% less than a conventional suitcase offering the same level of capacity. Our favorite thing about the Bago Travel Duffle Bag is its versatility. Being able to easily transport and store this bag thanks to its fold-away feature makes it a lifesaver too. This is the perfect bag if you need more space for gifts on your way back from holiday, if you need a bag with numerous separate compartments allowing for the dirty and clean items to be kept apart, or as a backup bag just in case your luggage were to break, and you need to be able to transfer your items into a new bag. Due to its foldable nature, there are no rigid arches or bottom supports, leaving the bag feeling rather flimsy. This can leave you in doubt whether or not the bag can support higher amounts of weight without a greater risk of tearing when compared to more secure bags. 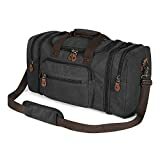 This duffle bag combines functionality with style, producing a bag that offers a wealth of storage space suited for business, casual, and even gym use. This ability to span multiple markets is why the Plambag Canvas Duffle Bag made it onto our top five list. Made from 100% high-density cotton, this bag offers a soft-to-touch canvas exterior while using nylon for its interior lining. This allows for easier cleaning and increased durability. All zippers and strap connectors are made from aluminum, leaving no flimsy fasteners on this bag. This bag offers a 50-liter capacity and measures 24.4 by 9.8 by 11.8 inches across its four separate compartments. Users will benefit from one large main compartment that can be accessed through the main opening or a back zipper, two exterior zipper pockets, one smaller front pocket, and if that's not enough, then there is even an interior zipper pocket for your valuables. Plumbag designed this duffle to be extremely versatile in its use, and to those ends, the two exterior pockets are completely removable, allowing the user to shrink the length of their duffle bag by four inches. This is great for those situations when you don't need all of that extra room and want to keep the bag as lightweight as possible. Plumbag has also thought about the safety of our luggage during travel. Hence, they have included four high-quality plastic cushions covered in film protection that sit along the base of the bag, which protects our luggage from any knocks and bumps along the way. These cushions also help to keep the bag clean as they're easily removed and wiped down. The compromise that buyers will have to make with this bag is its weight. Being made from 100% cotton does leave it much heavier than its polyester rivals and will typically have a shorter life expectancy. While the bag does break up into a smaller and shorter bag, you can still find bags within a similar size range that weigh a lot less and might serve one specific service better than attempting to serve multiple purposes. The Ledmark Outback Duffle Bag offers an uncompromising amount of space for those who need to transport large quantities of luggage and have no real need for the extra features found on most duffle bags currently available. 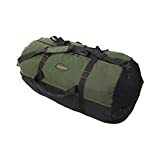 The Outback Duffle Bag boasts a single compartment that delivers maximum space and is available in five different sizes ranging from a medium (24 by 16 inches) up to colossal (72 by 22 inches). This bag has also been designed so that when it's not in use, it folds completely flat, making it easy to store out of the way. For ease of use, this duffle bag features numerous carry handles, which allows the bag to be easily lifted from various positions. Not only will you find the standard carry handle above the main compartment but also at either end of the bag as well as the sides. It even has a shoulder strap. Since it is made of 100% durable canvas material, this bag is fantastic for supporting heavier loads. It also features #10 lockable full-length zippers, allowing for longer and bulkier items to be stored in the bag. It has Velcro closure handles too, which are coupled with heavy-duty stitching throughout. Our favorite thing about the Ledmark Outback Duffle Bag is the simplicity of its design. The bag serves a sole purpose of allowing the user to easily transport a large amount of luggage, including bulkier and larger items, with ease. Having a full-length zipper across a bag that's significantly longer than others in its class is a huge benefit as well. For us, the downside to this bag would be for users who are looking to use this bag for a variety of uses that will, more often than not, require multiple compartments. For instance, those looking to separate their sweaty gym clothes from fresh clothes are far less likely to be interested in a single-compartment bag. The Gonex Travel Duffle Bag has made it into our top five list thanks to its convenience, versatility, and durability. This bag is built to serve a variety of purposes but with a heavy focus on its foldaway feature and how incredibly lightweight it is. 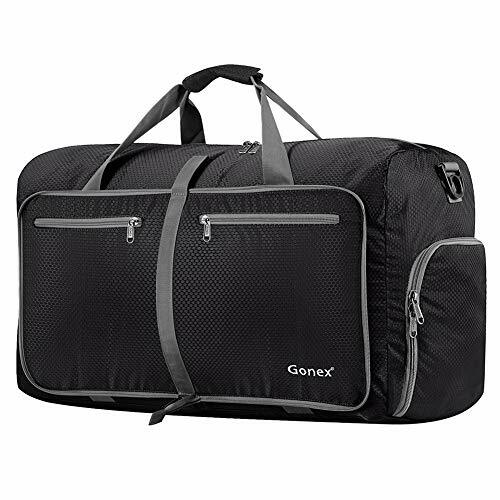 The Gonex Travel Duffle Bag is made from ultra-thin, tear-resistant nylon that allows the bag to be folded away onto itself. This, in turn, lets the user easily store the bag away or even inside another bag for travel purposes. Being made of such a thin material has seriously lowered the weight of the bag when compared to competitors as it only weighs 1.2 pounds when empty. With dimensions of 24 by 14 by 9 inches, this duffle bag offers a very reasonable 60 liters capacity. This space is comprised of a main compartment, an internal shoe or dirty laundry compartment, and multiple front pockets. Even though this bag is made from lightweight materials, it is extremely durable. The construction consists of honeycombed 210D nylon fabric, which is both water-repellent as well as tear-resistant. It also boasts premium metal zippers used across all compartments and reinforced stitching across stress points. Gonex has a focus on customer care, so to ensure that everyone that buys from them is happy with their purchase, they offer a 100% satisfaction and money-back guarantee. If you aren't happy with your duffle bag, then you have up to 30 days to get your money back, hassle-free. Products also come with a one-year warranty as well as a lifetime customer support service. 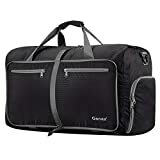 If you're looking for not only a functional duffle bag but also one that is visually appealing, then the Gonex duffle bag probably isn't the right one for you. Despite offering a relatively wide variety of colors, the design itself is rather lacking, leaving users with a solid vibrant color that matches very little. In order to ease you through the buying process of filtering out the features for you, we've compiled a few key items that you should consider when looking at any duffle bag. In this way, you can easily find the best bag that fits its intended use. The volume of a duffle bag is often depicted in liters. This tells us the total area of the space available. Hence, the bigger the number, the more space you have. Most large duffle bags will be in excess of 50 liters but can rise to well over 100 liters. If you are looking at a duffle bag, but they don't display the volumetric measurement, look instead at its length, width, and height measurements. Through these, you can quickly calculate the bag’s capacity. Firstly, you'll need to multiply these three sides together to gain the cubic inch value of the bag. This will be a rather large number but is quickly reduced once you divide it by 61. This will give you a rough liter value of the bag as one liter equates to 61.0237 cubic inches. This is a huge determining factor in a duffle bag that you end up with. Not only will this come down to what your intended use of the bag is but also personal preference. Canvas bags are certainly the more stylish variety of duffle bags available, offering a selection of colors as well as textures. These are often made from high-density cotton, which results in a great look but reduced water-resistance when compared to nylon bags. Being made of cotton, these bags are also heavier than their nylon counterparts. This means that they can't offer the same fold-away functionality. Nylon duffle bags vary in their construction material but typically range between 210T and 210D and could possibly even use different weaving styles such as honeycombing or hexagonal. These varying weave styles offer increased tear-resistance, making them extremely durable and great for a variety of uses. Nylon bags are certainly the lightest of the most common bag types, often weighing only a couple of pounds. While the lighter feeling of these bags often makes them feel flimsy and likely to break, they often have very similar, if not a higher, level of durability. If you're looking for a quick and easy gym bag, then you'll most likely want to stick to nylon. When it comes to waterproofing, nylon bags have the obvious advantage over their canvas counterparts. While canvas fabric bags will be treated to handle the weather and often use nylon inner liners, they have the tendency to absorb a large amount of water, making the bag even heavier than it originally was. Nylon bags, on the other hand, don't suffer from such a problem as they are simply wiped dry and are naturally water-resistant. With such a wide variety of duffle bags being available, it's important to take note of all of the extra features that are available. More than that, you should also determine whether or not they're applicable to you and what your intended use for the duffle bag is. Zippers: Whether they're lockable or not, this is likely to be important to those who may have to leave their bags in public areas, such as those going to the gym or traveling through an airport. Strap Connectors: Whether these are metal or plastic will make a huge difference to their life expectancy. Metal connectors are generally stronger but are also more prone to squeaking. Fortunately, this can easily be solved by simply oiling them as needed. Carry Handles: As well as looking to see if a shoulder strap is included, you'll also want to make sure that the handles are appropriately positioned. They also need to have reinforced stitching as these points will suffer from greater amounts of strain. Compartments: While a large central compartment is great, keep an eye out for additional pockets. These extra pockets offer a fantastic way to keep key items separate, offering places to keep valuables and dirty or clean clothes. There are even bags that come with ventilated shoe compartments. Below, you'll find a list of some of the most commonly asked questions when it comes to duffle bags. Duffle bags are often considered large, generic hold-all bags that are commonly associated with sporting activities or travel. They serve a general purpose of transporting items that require larger amounts of space between locations. When it comes to packing efficiently, everything greatly depends on what items you need to pack and the size and shape of your bag. Whatever you're packing, you'll want to place the heavier items towards the bottom of your duffle bag. This will prevent any crushing of more delicate items. If you're looking to pack clothes only, then rolling them up is a real space saver. In addition to this, you can also stuff your socks and underwear inside your shoes. Duffle bags follow the same carry-on restrictions as all others bags, which is limited to 9 by 14 by 22 inches. So, if you're looking for a duffle bag specifically for travel purposes, then you will be limited to the smaller sizes available. Unfortunately, this will greatly affect the number of options that are available to you. Duffle bags are 100% allowed as a carry-on as long as they don't measure greater than the maximum limit. They should also meet all other aviation regulations. This is a mixture of personal preference and intended use. A great example is those who are heading to the gym and whether they are looking to shower and change at the gym or at home. Those showering at the gym will need to take toiletries, a towel, and a change of clothes. Hence, they need a much larger bag compared to those who are just bringing the essentials, such as a gym towel and a bottle of water. Some people also like to have more space than they need so they always have the option of packing more into a single bag rather than spilling over into a second one. Others aren't a fan of this as they don't want to carry around a bag that's too large during the occasions where this isn't the case. Carefully think about what you'll be using the bag for and what is the bare minimum it needs to hold in order to be able to decide the size of duffle bag that you need. 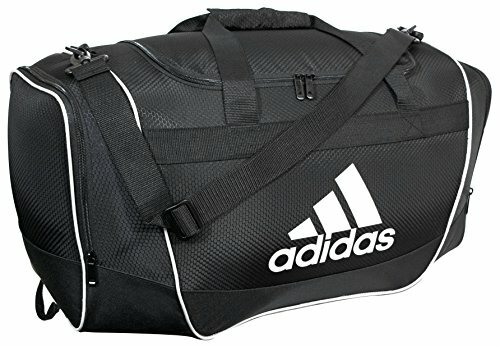 We'll be wrapping up this piece with our recommendation as the best duffle bag, which, after careful deliberation, we have decided is the Adidas Defender II Duffle Bag. This bag managed to grab our number one spot as it's available in a variety of colors and styles as well as different sizes. This bag also considers functionality by offering numerous pockets that include a separate shoe compartment. This separate storage is ventilated and can serve other uses as well. For those looking for something a bit more stylish, perhaps, would like to consider the Plambag Canvas Duffle Bag. This bag offers the user the ability to adapt the size of the bag to meet their needs. It is also extremely durable and has a much more casual look about it when compared to our other bags.